and tastes delicious! I love squash anyway, but it was fantastic prepared this way. My husband gave it a "10", so that means it's good, real good! I hope you'll try it! 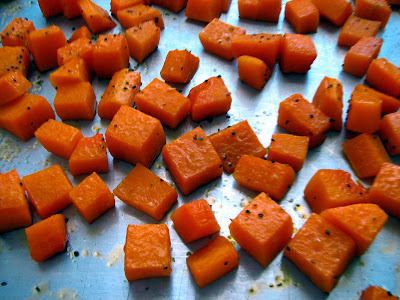 Place cubed squash in a greased baking sheet and drizzle with the 2 tsp. olive oil. Sprinkle with the salt and 1/8 tsp. butter. Bake at 400 for about 20 minutes til tender, but not mushy. Meanwhile, heat the chicken broth in a small sauce pan or in the microwave. In a large skillet, saute onion in melted butter until tender. Add orzo and garlic and stir for 2-3 minutes. 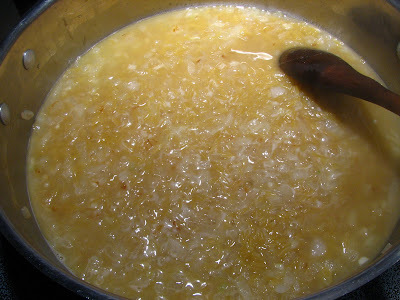 Stir in 1 cup of the warm broth and continue to stir until all the broth is absorbed. Add the remaining broth 1/2 cup at a time. Allow liquid to absorb before adding more. Cook until risotto is creamy and orzo is almost tender, or al dente. Cooking time is about 15-20 minutes. Add the herbs, remaining 1/8 tsp. pepper and the roasted squash. Toss gently. Garnish with shaved Parmesan, if desired. I loved the mix of flavors in this dish, I only regret that I didn't have fresh sage to use. Next time, I'll definitely buy some. The roasted squash is delicious, of course, but with the fresh thyme mixed in it was heavenly. I'll be making this often, as I couldn't quit eating it! Makes about 4 servings. Enjoy! Its nice you get a little rememberance of your mom every month in the mail! What a nice way to remember your mom! The risotto looks so warm and delicious! I love when my plate is colourful in addition to being delicious. Can you believe I haven't had a single piece of squash this year? I guess I should do something about that before they are out of season. 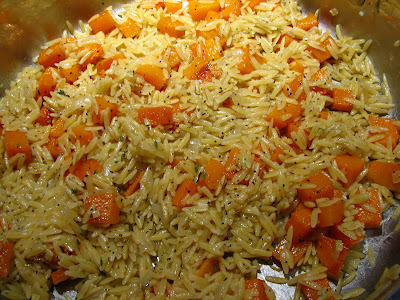 forget rice, i'll take orzo any day, and combining it with sweet and savory butternut is a great idea! perfect dish, lynda! What a wonderful, lasting gift - and then you get to cook and remember... and that is the loveliest orzo - perfect for this time of year and packed with flavor. What a beautiful, colorful dish. Cooking your mom's recipes, what a lovely way to feel close and remember her. What a great side dish. I love the ingredients you've used here. I've bookmarked this for later in the week. I have to give this one a try. what a wonderful way to remember your mother. 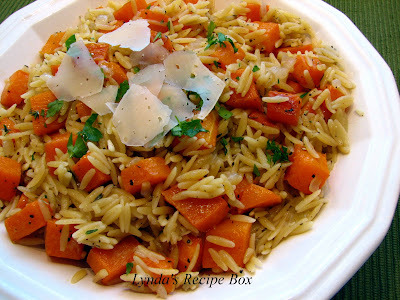 Lynda- This butternut Orzo risotto looks realy good. This would be a great meatless meal. Besides, I love butternut squash. It looks so delicious Lynda. Lynda, this looks dee-lish! I can sometimes buy the squash already peeled at the grocers (yippee!!). Love the colors and the herbs must really punch it up! Sounds so healthy. Yum Yum! I like Country Woman magazine too. what a nice way to remember your Mom. So colourful and healthy and delicious looking! 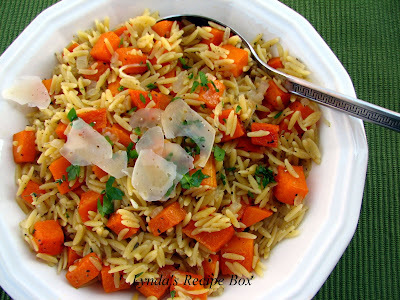 I love butternut squash and I love orzo. Sounds perfect! That looks amazing, I only know how to make Risotto one way, but this looks really good! Yum! This looks so good as do many other recipes on your site. I just started following you today. Your recipebox is my kind of cooking. Thanks for sharing. I love how richly colored the butternut is in this dish. It's gorgeous! omg this looks so good!! I love risotto cant wait to try this! As soon as I saw the picture & read the ingredients I knew that this recipe was going to be a winner! The changes that I made were: I purchased peeled, cubed butternut squash at the market. We like highly seasoned food so I did not measure the S&P just eyeballed what I thought we would like and I cooked with the herbs rather than just adding them towards the end. My family loved it!